As you know, iPhone has Safari browser onboard. It's pretty neat and great working... but sites with huge layouts don't look good on small iPhone screen. When you have own blog it would be good to display it in customized way. So, we have iui now we need some PHP RSS reader. We'll use SimpleXMLObject class because it's ... simple. As you can notice in php code we have function calls to something called xcache - it's very nice plugin for php speeding up your code by doing magic opcode caching. But for now we'll use different advantage of cache - you can store variables just in your server memory and get access to it on different php file calls. I this case we use this to download RSS feed once and store it for a while. So if you refresh your browser or some one else will go on your blog we do not need to download feed again. Now we have our blog's feed and we can display it in nice iui internface. This is excellent - You don't explicitly say so or in the Google Download instructions, but XCache is mandatory to be able to run the code - yes ? It's not mandatory, as you can see in code I use $cache = function_exists('xcache_set'); so when we do not have xcache everything should work just fine. Hmmm I'm obviously doing something wrong then as I get an error retrieving the feed URL. Does the Feed URL look like the below, if for example Digg was the feed you were after ? I like this, nice and simple. However i'm getting the same error as jiml. Can you please explain how the $feedURL works? And also how it should be setup? Eg the Digg example above. Also getting the same error message as other commenters have posted after entering my XML feed... I also did exactly what jiml did to test with the same result... Anyone figured this out by chance? is in reference too on the main blog? I can't find it in the PHP file and wonder if this is where we are going wrong? Had some small success. I've managed to get it running locally but only some RSS feeds work. The example belowe works a treat locally. 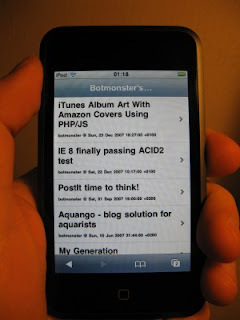 That works fine locally however if I replace Botmonsters RSS feed for Diggs I get the error. It's really a good work. But, some questions. When I click hyperlink in first page, it works. I am also having a feed retrieval error. Did this get resolved? I have only seen comment posts up to 2008. My feed is http://www.movida-london.com/eventscal/xml.php if anyone is able to advise that would be great.